On December 30, 2017 Atlantic Broadband purchased several dark fibres throughout south Florida from FiberLight, LLC for a consideration of US$16.8 million. On the same day, Atlantic Broadband signed an Asset Purchase Agreement (‘’APA’’) with FiberLight, LLC to acquire all of its fibre network and corresponding assets located on the East Coast of south Florida for a consideration of US$34 million, which is subject to regulatory approvals and customary closing adjustments. Cogeco has an extensive presence on the US east coast through its ownership of Atlantic Broadband, and this move will give them a bunch of additional metro and regional fiber in their diet along the southeastern coast of Florida. 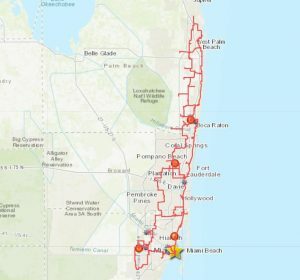 FiberLight's footprint there stretches from West Palm Beach down through Miami, passing through Ft. Lauderdale and Boca Raton along the way and representing one of the company's five distinct regional footprints. Now the question becomes, will FiberLight be selling off any or all of the other four distinct pieces, i.e. their western Florida networks, their Atlanta metro footprint, their DC area metro footprint, or the huge Texas statewide network. It's that last one that would be fought over the most, as it is the most unique and would fit so nicely into the asset bases of both Zayo and Crown Castle, among others.